Criterion Barrels Inc (CBI Inc) long time friend of 308AR.com and our sibling sites (AR15 Tactical, Modular Rifle and Combat Rifle). 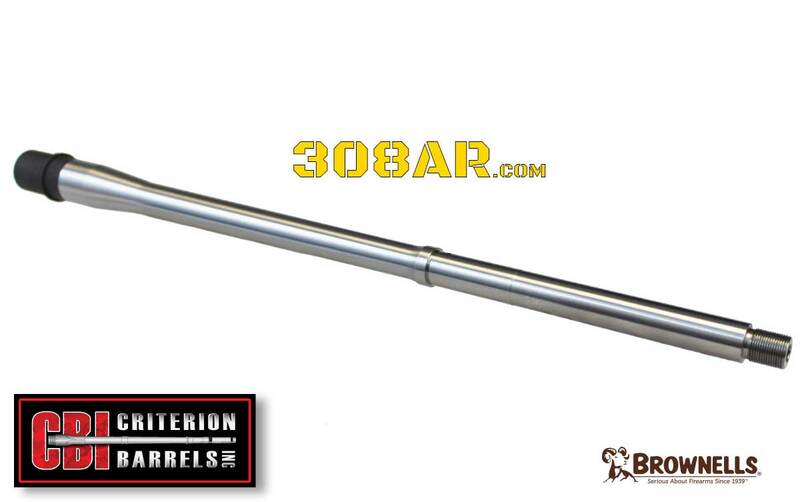 CBI is always hard at work manufacturing some of the best 308 AR rifle barrels in business. CBI 308 AR barrels are proof that you don’t have to spend a fortune on a 308 barrel to get sub moa accuracy. As mentioned previously CBI 308 AR Barrels are the heart of Fulton Armory Titan 308 and American Defense Manufacturing (ADM) UIC semi automatic rifles. Criterion Hybrid contour match grade .308 AR barrels offer an ideal configuration for those seeking extreme accuracy without the added weight of a heavy barrel contour. These .308 AR barrels feature a M118LR chamber. The longer throat of the M118LR enables Criterion .308 AR barrels to improve upon the performance of loads utilizing heavier bullets, serving to reduce wind drift when fired at longer ranges. Note: highlighted links all point to the Criterion Barrels Section of the Brownells website. Too hard to keep ever changing links updated. This configuration is designed to accommodate either .308 Winchester or 7.62x51 ammunition, and comes complete with an installed barrel extension. CBI .308 AR barrels are compatible with DPMS, Remington, and Fulton Armory pattern rifles, and accept muzzle devices with a 5/8x24 thread. An indent is provided opposite the gas port to enable easy installation. Chambers are finished, but headspace should be checked prior to installation. Stainless steel variants are available in 20 and 22 inch lengths. These barrels are button rifled, and have been hand lapped to ensure consistent bore uniformity. 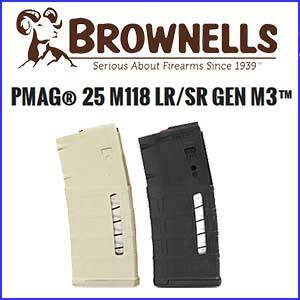 The 20″ Hybrid utilizes a 0.750″ gas block, while the 22″ Hybrid utilizes a 0.875″ gas block – gas blocks NOT included. This configuration is designed to accommodate either .308 Winchester or 7.62x51 ammunition, and comes complete with an installed barrel extension. CBI .308 AR barrels are compatible with DPMS, Remington, and Fulton pattern rifles, and accept muzzle devices with a 5/8x24 thread. An indent is provided opposite the gas port to enable easy installation. Chambers are finished, but headspace should be checked prior to installation. Chrome lined variants are available in 16, 18 and 20 inch lengths. These barrels are button rifled, and have been hand lapped to ensure consistent bore uniformity. Criterion Hybrid contour match grade 6.5 Creedmoor AR barrels offer an ideal configuration for those seeking extreme accuracy without the added weight of a heavy barrel contour. Featuring a flatter trajectory and higher ballistic coefficient than the traditional .308 Winchester alternative, the 6.5 Creedmoor has grown in popularity with many long range shooters. Headspace should be checked prior to installation by a qualified gunsmith. NOTE: The 18″ 100-019-351 utilizes a .750″ gas block while the 22″ 100-019-352 utilizes a .875″ gas block (NOT include for either). Note: Many .308 AR bolt manufacturers advertise their bolt as compatible with DPMS pattern .308 AR rifles, lug and bolt face tolerances often vary widely between different manufacturers. This is in opposition to the AR-15, where there is a uniform industry standard. Criterion barrels are gauged at the factory with Fulton Armory .308 AR bolts. We have also had success in demo rifle testing with bolts from DPMS and JP Enterprises. If you have any questions regarding bolt compatibility, please email us at contact@criterionbarrels.com.